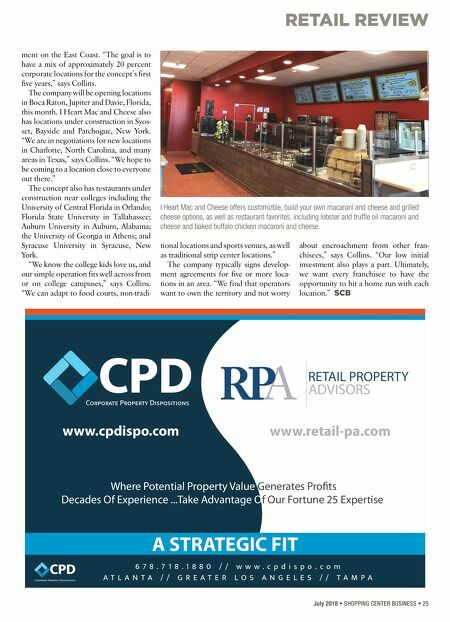 RETAIL REVIEW 24 • SHOPPING CENTER BUSINESS • July 2018 W ith ingredients like lobster, short ribs and truffle oil, the classic children's menu en- trée of macaroni and cheese is being re- vamped for consumers of all ages by fast casual concept I Heart Mac and Cheese. The restaurant's menu centers around customizable, made-to-order macaroni and cheese, grilled cheese sandwiches, salads and tater tots with add-ins includ- ing everything from bacon and crispy chicken, to pickles and jalapenos. "The creativity of our dishes is only limited by the guest's imagination," says Daniel Collins, president and chief development officer for I Heart Mac and Cheese. The menu also offers a variety of fa- vorite macaroni and cheese dishes for those not looking to go the custom route. These include offerings like Baked Buffa- lo Chicken with buffalo sauce and blue cheese; Philly Cheese Steak with slow cooked short rib, onions, peppers and muenster cheese; The Cuban, with mojo marinated pulled pork, ham and dill pick- les; and Pepperoni Pizza with marinara, pesto sauce and pepperoni. While one might assume the typical customer to be families with children, the restaurant appeals to all ages — includ- ing millennials. "We often have parents come in telling us, 'our kids love mac and cheese,' and then they realize it is much more than a food for children," says Col- lins. "They see ingredients like lobster and truffle oil, they get a taste and become big fans themselves. We also have high school and college students that frequent our restaurants in the afternoon after school or between classes." One thing separating the company from other fast casual concepts is it's quick service time and lack of need for hood systems, gas lines and grease traps. "We can serve a line of guests out the door with just four to six employees total on staff, and our service time is generally under four minutes," says Collins. "Our simple, chef-inspired menu requires a low investment entry point for franchisees, as all cooking equipment is electric." Each restaurant is between 1,600 and 1,800 square feet. "We can fit into any retail space because of the lack of hood systems and grease traps within the restau- rant," says Collins. "We like to see good population density with families, and an average or better household income when looking for space for a new location. We like to see a good mix of businesses in the area, so that we can capture great lunch- time business." Collins deems the décor for I Heart Macaroni and Cheese locations, "contem- porary farmhouse whimsy." Each location is simply decorated, bright and designed with operational efficiency in mind. The company is currently franchising, with six corporate locations open and an- other 12 leases signed and under develop- Each I Heart Mac and Cheese location is simply decorated, bright and designed with operational efficiency in mind. 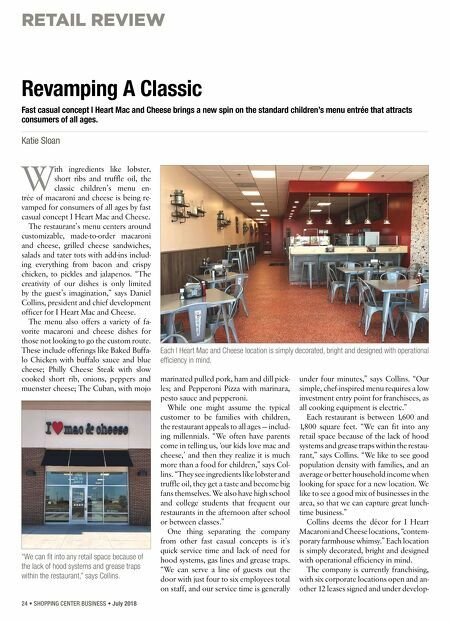 Revamping A Classic Fast casual concept I Heart Mac and Cheese brings a new spin on the standard children's menu entrée that attracts consumers of all ages. Katie Sloan "We can fit into any retail space because of the lack of hood systems and grease traps within the restaurant," says Collins.